Dedicated to the people we share them with. Sublingual cannabis products, on the other hand, are pulled straight into the bloodstream through the membranes in the mouth. The onset only takes 10-15 minutes and the effects feel more like smoking than ingesting a traditional edible. Driven by a need for sensible and reliable cannabis products, we worked around the clock researching, designing, and formulating something we feel good introducing into our own lives, something we believed would heighten the way cannabis was used in everyday life. Every single element of Slips was designed with discretion in mind. Subtly labelled, beautiful pocket-sized packaging, and the simple under-the-tongue method allows for cannabis enjoyment anywhere / anytime. Kin Slips are perfect while on the run, at work, or exploring the world. We are all at our best when we take just the right amount of cannabis that works for us. Each and every batch of Slips undergoes a multi-step, in-house and third party testing process to ensure accurate dosage and potency, so you feel exactly how you need to feel, when you need to feel it. Don’t let our high-tech delivery method fool you, Kin Slips are 100% natural and comprised of the highest quality ingredients. We combine California grown cannabis, all natural ingredients, and plant derived terpenes to make a product that’s vegan-friendly, sugar-free, non-GMO, and always in good taste. Our carefully crafted blends of cannabinoids, terpenes and natural ingredients are formulated for positive effects on lifestyle and health. Working with feedback and data from our community, we have been able to achieve perfectly balanced formulas safe for daily use. Flavor hints of Tarragon and Citrus. 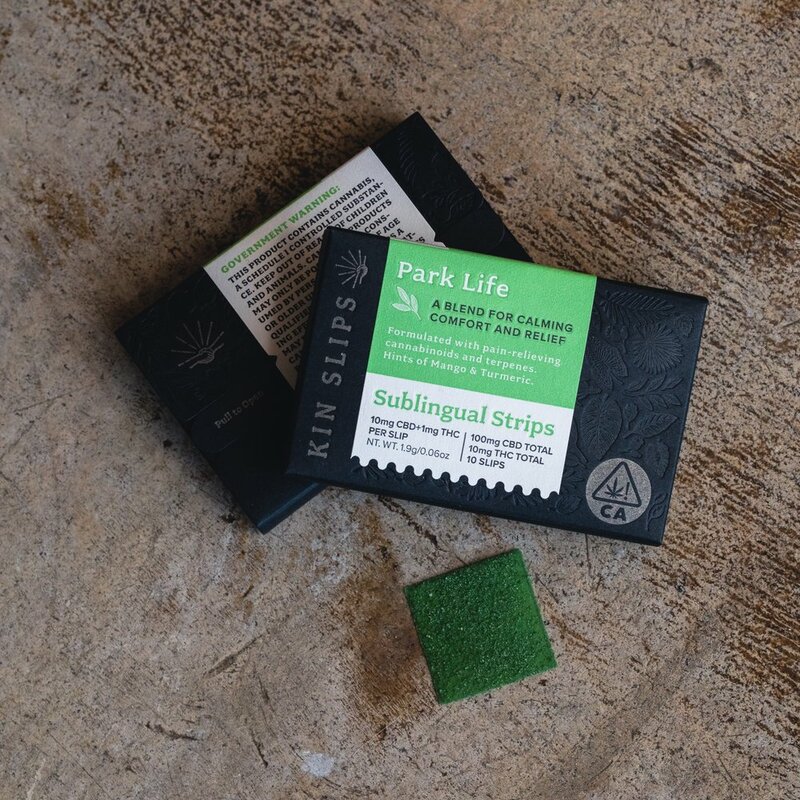 Kin Slips can be found at some of the best medical cannabis providers in California. Be sure to call ahead to ensure they have our products in stock - they sell quickly and we’re not gonna lie - sometimes they run out!